A finicky eating boxfish is a rare thing indeed. A female Whitley's shown. Hi Bob and Team, as always thanks for the great advice you give. 15 days ago I got a 7.5" golden puffer. It was supposed to have been in someone's tank for 2 yrs, but I believe it has not been and am pretty sure it was wild caught Hawaiian and not eating so the person sold it to me. It started in QT but didn't move and tucked it's fins in a ball so after a bit, I put it in my 180 predator display. Water parameters are good- 5 to 10 ppm nitrates, salinity 1.025. Large sump with a monster skimmer & water changes every 2 weeks of 25%. It has no tankmates to bother him, just 2 lg eels that stay in their tunnel except every 3 days they come out to eat, a sm green spot puffer that eats and is full and doesn't do much. It's skin and appearance look good, it's thin and it's color is lighter that usual, it does swim around the tank a bit and sit on things. I've read tons of your FAQ's on puffers not eating and have tried every food I can think of- live mussels/clams/oysters on half shell, silversides, algae wafers, krill, squid, shell on shrimp, live emerald crabs, hermits, small marine snails, fish chunks, scallops. Been to a couple stores to get ghost shrimp & peppermint shrimp but they've been out. Found some peppermint shrimp I'm picking up tomorrow to try live food. Spent a lot on food options and willing to do about anything to get the puffer eating. The puffer will look at food but not eat it at all. From reading FAQ's I have an idea of how to force feed. At this point should I force feed a mash of food, vitamins, and perhaps garlic guard that are recommended in FAQ's? Or anything else I can try? Should I see if it eats the peppermint shrimp before force feeding, or try force feeding first? P.S. I wrote about an orange shoulder tang with an eye problem a while ago and followed your advice. The fish has recovered, is in my large reef system and is fat, healthy, gobbling food and begging for food! So thanks! Hi Bob, I am happy to report that the golden puffer started eating! He was really interested in the snails, hermits and peppermint shrimp and after he looked at those for a couple days he ate what I gave him. I kept offering foods as you suggested and he began nibbling bay scallops and progressed to eating large shrimp pieces. He didn't like the garlic guard but is eating the shrimp well without it. I'll keep trying other foods too. He is now full and fed, which is great because I was so worried. Here's a funny picture of how the introduction of peppermint shrimp went a few days ago. in particular have gone on complete hunger strike for 3 days now. My QT tank is about 10 feet from the main display. Is it possible that the fish are stressed out by the Catalufa in QT? The Cowfish has always been a "slob" at feeding time but know nothing at all. I've had him for about a year and a 1/2 now. Water parameters are perfect and I've changed nothing else. For the time being I've put a divider in front of the QT tank so it cannot be seen by the main tanks inhabitants. Can this possibly be the cause? I'm thinking it may be an internal parasite inside the Cowfish? I've read that they are common in Cowfish. There are no aggressive fish that could have bothered it, plus I've been watching the tank for hours to no avail. It's been 3 days without food, and right now it's in the top right back corner with black "stress" markings on it. I'm quite sure it has been releasing toxins for 3 days as well. The other fish seem to have less appetite but are behaving normally maybe because of the toxins. I only have one QT tank which is occupied right now and just don't know what to do about this. Hello I have a Stars & Stripes puffer, and also a Niger both babies. Looking in to getting a Humu trigger and a Porc puffer to finish my tank. I have two questions one can I start a separate tank for breeding rams head snails and common snails. Will these be alright for a marine puffer. Second with empty shells , would I be able to take clams, mussels , shrimp, veggies, with some beneficial additives , in a sense blender them and fill hermit shells with all the combined foods, freeze them and feed them that. I've had the weirdest puffer for a year now. He will NOT eat the shrimp or snails in the tank. He will NOT even eat the clams unless I break a small hole for him to start with. He loves flake food and pellets. I try to keep him away from that and encourage the clams for his teeth grinding but my problem is this: every time I put in a clam, the hairy black algae grows crazy. I got 10 snails (turbo & i forget) to eat algae, but they couldn't keep up or didn't like it, and they did not multiply at all like I heard they do, and most are dead. Even if Turbo snails eat a given type of algae, in a pufferfish tank, they'll be pestered. While the puffer mightn't eat them whole, it certainly would peck at them, making it impossible for the snails to graze freely. Any ideas? I'm thinking of breaking open snails to feed if they don't produce algae. I heard of feeding silverside or shrimp. He will eat dead store shrimp, but the membrane on silversides & shrimp are not very hard if I could bite through without MY teeth grinding down. 1) Is the thin skin of a shrimp really enough to grind down his beak? 2) What loves to eat black algae that is obviously from clams? thank you very much! I never received so much response. The only thing I disagree with is that my tank was algae free for well over 6 months, and 2 days after a clam, BOOM black hair algae. <When the clams die and decay, they produce ammonia and other chemicals. These "feed" the algae in your tank like a fertiliser, and as you say, BOOM, black hair algae everywhere. The relationship is quite well known. <That's a big shell! I'm surprised this Arothron can even get at the food. then started again upon more clams. Thanks again! Hope all is well with you all. Well, I have another question that has cropped up regarding my porcupine puffer and my dog face puffer. I can't seem to get these guys to eat any hard stuff (i.e clams, mussels, snails) except for ghost shrimp. the dog face investigated it but then left but the hermit crabs had a hay day. The hermits are part of the family now as I originally got them to hopefully entice these guys to try some hard shelled foods. I've even soaked everything in garlic but that hasn't worked either. Any ideas? Is mysis soaked in Selcon good enough? Even when I mix foods, porcupine only picks out the mysis. after they hatch? I usually give them to my LFS. Blind puffer - 04/13/07 My black puffer seems to be blind although he seems to be perfectly healthy. It started after a stressful event when I had to trim his teeth. He stressed out and got kinda sick looking so I put him in my hospital tank. <Did you anaesthetize him properly? Read the two WWM articles on trimming puffer teeth, if you have not yet. Did you accidentally touch his eyes or have you used to much force while trimming the teeth?> He looks great now, but isn't eating on his own. If I hand feed him and put it in his mouth he eats very enthusiastically. <Carry on feeding him that way. Provide a varied diet enriched with vitamins and hope the best.> I think he just can't see the food. His eyes look perfect and he moves them around. 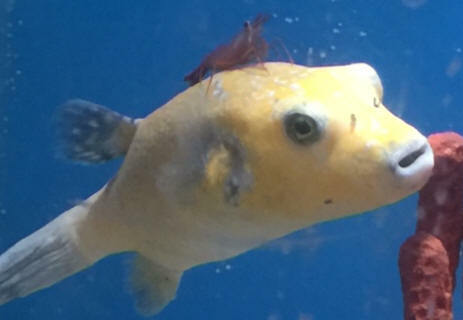 You'd never guess there was anything wrong with this fish. Ever heard of this kind of thing? <All blind puffers I have seen had cloudy or wounded eyes.> Do you think it might cure itself? <No, if he is really blind. I hope I am wrong.> Thanks for your help. <You are welcome. Good luck. Marco.> Greg. Porcupine fish could not eat his meal tonight! I have read all about lockjaw and have tried to prevent it by offering a varied diet and adding vitamin supplements. <Lockjaw is not really understood yet. There are many theories out there as to why it happens, but sadly most of them are just that... theories. I have read quite a few articles on the subject and do believe that this condition is most likely do to a deficiency in the puffers body. I believe that like many individuals do that it's thanks to the thyroid gland on the porcupine puffer, and have read many stories stating that adding iodine to the water does fix this. When I received your email, I sent out emails to many experts to see what they thought. And all of them came back with different ideas how to treat it. So, I believe that your best course of action is to check out the Puffer Forum (http://puffer.proboards2.com/) There are many intelligent puffer people on that board.> This is the first time he would not eat. He is trying to eat. He can't open his mouth to take it. What do I do?